Has "TURN: Washington's Spies" left you feeling a little… spy-curious? After a season full of historically-inappropriate spy gadgetry (and almost two full seasons of teasing us with cameos in the TURN opening credits), it was truly refreshing to see one of the most famous and most bizarre inventions of the American Revolution in action on the small screen. 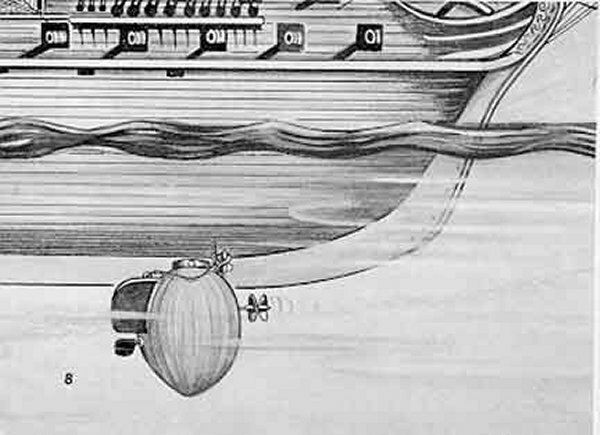 I’m talking, of course, about the submarine Turtle, invented by Connecticut patriot David Bushnell in the 1770s. A 19th century diagram of the Turtle, based on contemporary descriptions. 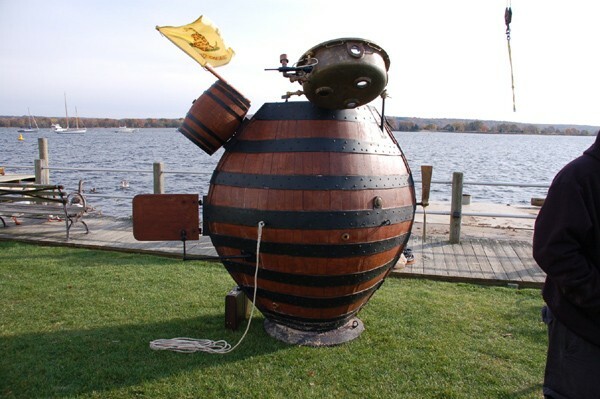 Life size, fully functional reproduction of the submarine Turtle from the Turtle Project, a collaboration between Old Saybrook (CT) High School and the Naval Undersea Warfare Center, Newport, Rhode Island. The submarine, piloted by Roy Manstan, was launched on 10 November 2007 at the Connecticut River Museum in Essex, Connecticut. Source: Naval History and Heritage Command website. The submersible Turtle [was] the world’s first combat submarine. Named Turtle because its inventor, David Bushnell, believed the craft resembled “two upper tortoise shells of equal size, joined together,” it saw action in the first days of the American Revolution. Designed in 1771-1775 while Bushnell was a Yale College undergraduate, it embodied the four basic requirements for a successful military submarine: the ability to submerge; the ability to maneuver under water; the ability to maintain an adequate air supply to support the operator of the craft; and the ability to carry out effective offensive operations against an enemy surface vessel. To achieve these requirements, Bushnell devised a number of important innovations. Turtle was the first submersible to use water as ballast for submerging and raising the submarine. To maneuver under water, Turtle was the first submersible to use a screw propeller. Bushnell was also the first to equip a submersible with a breathing device. Finally, the weaponry of Turtle, which consisted of a “torpedo,” or mine that could be attached to the hull of the target ship, was innovative as well. Bushnell was the first to demonstrate that gunpowder could be exploded under water and his mine was the first “time bomb,” allowing the operator of the Turtle to attach the mine and then to retire a safe distance before it detonated. Omphalotus nidiformis: One type of bio-luminescent fungus. Foxfire light is often very dim. This photo is the result of a 30-second exposure! Bushnell had devised Turtle as a means of breaking the British blockade of Boston harbor but because of problems with the vessel… the British fleet had departed from that harbor before Turtle was operational. The first attack on an enemy vessel [the British warship HMS Eagle] by Turtle took place in New York harbor in September 1776. Turtle functioned as anticipated, but the attack… did not succeed. Two subsequent attempts to attack British warships were thwarted by navigational issues and tides. Before Turtle could be re-deployed, it was sunk along with the sloop transporting it by enemy fire on 9 October 1776. Although recovered, Turtle saw no further service. Its eventual fate remains a mystery. While a submarine “practical” for warfare with range, power and reliability had to await the coming of the mechanical age, Turtle was an indispensable first step, which made future developments possible. Later [in life], Lee described his unsuccessful attempt to fasten the mine [to the HMS Eagle]. “When I rowed under the stern of the ship, could see men and deck and hear them talk-then I shut all doors, sunk down, and came up under the bottom of the ship, up with the screw against the bottom but found that it would not enter.” Unable to affix the mine and with daylight upon the water, Lee decided to make for shore before the vessel was discovered by passing boats. But it was too late. Guard boats put off from shore in his direction and soldiers mounted the fort on Governor’s Island to catch sight of the strange craft. Lee writes that he “let loose the magazine [mine] in hopes, that if they should take me, they should likewise pick up the magazine, and then we should all be blown up together…” Ezra Lee did not lack courage, only experience in a craft no one on earth had ever before piloted in action. The mine did explode, frightening off the pursuing guard boat; Lee escaped with his life and with Bushnell’s machine. So how accurate is TURN’s use of the Turtle in the Season 2 episode “Providence”? TURN scores much higher than usual regarding historical accuracy when it comes to their use of the Turtle! In case there was any doubt, none of the Turtle’s missions involved Caleb Brewster or any part of the Culper Spy Ring whatsoever; if you look at our TURN Historical Timeline, you’ll find that the real-life Turtle set sail two full years before the Culper Spy Ring was even formed. That said, the show’s incorporation of the submarine into its alternate history storyline was certainly entertaining, and it very closely paralleled pilot Ezra Lee’s original mission of 1776. (The notable exception being Caleb’s success in blowing up an enemy ship with an underwater mine where Lee had failed!) The Turtle used in the show is a dead ringer for the meticulously-researched 21st century museum replicas, and Caleb even mentions the use of Foxfire as a light source! Regarding Ben Tallmadge and “Davey” Bushnell meeting at Yale: Tallmadge (Class of 1773) was two years ahead of Bushnell (Class of 1775) at Yale, so their educations did overlap by two years. However, since Bushnell matriculated at the unusually ripe old age of 30 and was therefore twice as old as the average Yale student, he may have had less social interaction with his fellow undergraduates than a typical student — so Tallmadge’s line about how he “didn’t know much” about him makes a lot of historical sense, too. Cutaway model of the Turtle in the US Navy Submarine Force Museum in Groton, CT. If you want to see (or climb into) a Turtle yourself, Connecticut is a good place to start. The State of Connecticut is pretty darn proud of its submarine heritage: During the Revolutionary War, CT native David Bushnell’s efforts found widespread support among prominent Connecticut patriots like Silas Deane and Governor Jonathan Trumbull, who actually ended up convincing George Washington to support the Turtle venture. Modern-day Groton, Connecticut, the “Submarine Capital of the World,” is home to an active US sub base, the nuclear submarine manufacturer Electric Boat, and a museum that houses the first nuclear submarine in the world, the USS Nautilus. So it’s little surprise that Connecticut is home to at least three full-size Turtle replicas. Two of them reside at the Connecticut River Museum in Essex; one is a cutaway model you can climb in yourself, and the other is a fully-functional reproduction that embarked on its maiden voyage in November of 2007. Another cutaway model, complete with a mannequin of Ezra Lee inside, can be found at the same Submarine Force Museum in Groton, CT that is home to the USS Nautilus. 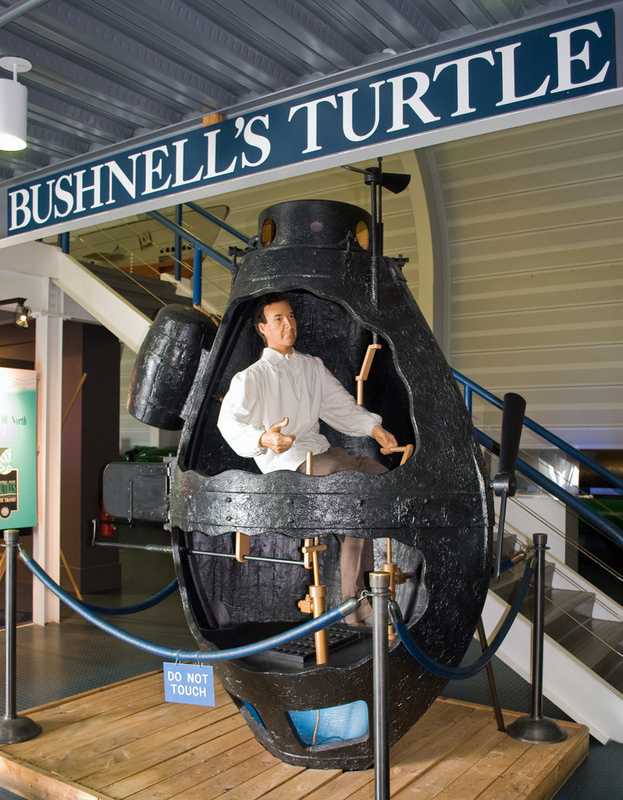 The Royal Navy Museum in Gosport, England also has a Turtle replica, although their model is likely an older one, given that it’s much more spherical than the more recent, 21st century American replicas. If you were feeling charitable, I suppose you could argue Mr. Riley was helping to keep the fascinating legacy of the Turtle alive in his own… unique way. On his own website, which has plenty of additional pictures and video of the submarine launch, he claims his voyage helped expose persistent security lapses surrounding New York Harbor. 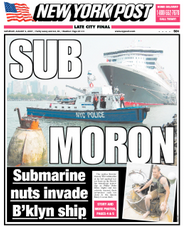 Whatever your opinion of Riley’s “marine mischief,” at least we got to see a replica of a Revolutionary War submarine on the cover of the New York Post, complete with a snarky headline! There’s so much for to be said about the history of the Turtle and the brilliant innovation that went into it, but alas, there is only so much we can stuff into one blog post! For more Turtle articles, primary sources, sketches, and other resources, see the Further Reading section below. This page is the online mother lode of primary source documents concerning the Turtle. Several of these descriptions of the Turtle sound like old science fiction novels — they are some of the most easy-to-read and engrossing 18th century documents you’ll ever come across. Be sure to check out Benjamin Gale’s original description of the Turtle in 1775, and Ezra Lee’s firsthand account of his adventures piloting the Turtle in 1776! You can also read post-war correspondence between George Washington and Thomas Jefferson concerning the Turtle. Excellent article with more detail on Bushnell and the innovations that made the Turtle unique. Collection of photos, diagrams, and sketches of the Turtle from a variety of sources. This entry was posted in material culture, Military History, Spycraft and tagged American innovation, american revolution, benjamin gale, benjamin tallmdage, Caleb Brewster, connecticut history, david bushnell, duke riley, ezra lee, foxfire, george washington, jonathan trumbull, military history, naval warfare, New York City, Revolutionary War, silas deane, submarine history, submarines, thomas jefferson, TURN, turn amc, TURN: Washington's Spies, Turtle, Turtle submarine, US Navy, USS Nautilus, yale college. "TURN to a Historian" is an independent blog for people searching for historically-accurate information and analysis about "TURN: Washington's Spies", AMC's fictionalized television drama about Revolutionary War spies. Click on the title of a post to view the comments and join the conversation! TURN Season 3: All Quiet on the History Front?